Affirmations - Definition and Use. Affirmations can change your life for the better if you know how to use them. Here are more than 500 of them for every situation in life. Definition: These are simply any positive or negative statements that we make, as we go through life. They can be natural, automatic statements or statements made on purpose. Does this include all words and statements that we make during our lifetime? Yes and No. Statements related to some aspect of the past, present or future are indeed so considered. The other utterances, which we shall call as 'miscellaneous statements', need not be so considered. For example. 'Let's go for a walk', 'How are you? ', 'I may be late for dinner tonight' are 'miscellaneous statements'. 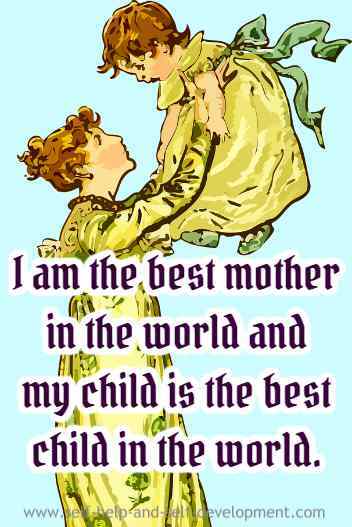 Examples of affirmations are given below. All new movies are boring. There is always a traffic jam in the morning. These are natural statements that bring out our true feelings as we go through life. These are affirmations. I am losing weight every day without effort till I reach my ideal weight of 60 kilos. 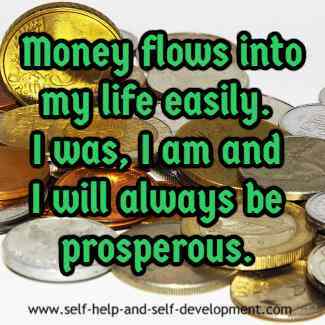 I am a money magnet and money flows into my life effortlessly. I am healthy and strong. I live life to the fullest. These are statements of intent. Through these statements we express our desire of how we want our life to be. These are also affirmations. We are going to concentrate on the second type, that is the statements that spell out our desired future - statements that can change our life for the better. The wonderful thing about these affirmations is that the more we use them, the more our life starts resembling them. The principal behind the working of these affirmations is similar to that of drops of water falling on a rock. A few drops will not make any difference to the rock but if the drops fall continuously, then, over a period of time, the rock will be worn out. This quote succinctly explains the working of affirmations. If we want to change our life for the better, we have to hold different thoughts in our mind, different than the ones that normally occupy our mind. Every person has a set of different thoughts that occupies his mind on a regular basis. Our thoughts are determined by our social milieu, our family upbringing, our education, our experiences in life and a variety of other factors. A person leading an average life will have a different set of thoughts than a person successful in some field. If the average person wants to be successful, he has to think like the successful person. If a poor person wants to be rich and prosperous, he has to think like a rich and prosperous person. How does one change one’s life by changing one’s thoughts? When we are in a certain situation, we think in a certain way. As a result, certain neural pathways are formed in the brain. Later, when we find ourselves in a similar situation, because of the already formed neural pathways, we think similar thoughts and that results in the same old actions. Hence, nothing new comes out of the situation. When we deliberately change our thoughts over a period of time, new neural pathways are formed to correspond to these new thoughts. Thus, when a particular situation arises, the brain does not automatically think the old thoughts. Rather, a new thought is produced in response to the same old situation. New actions are now explored. A new and different outcome is now a distinct possibility. Another way of looking at it is this way. The subconscious mind cannot differentiate between real and imaginary situations. If we feed the subconscious mind with imaginary situations depicting our desired reality, then after some time the subconscious mind starts believing it. When the belief becomes strong enough, it tries to match the new inner scenario with the outer reality of life. As these two are different, and as it cannot change the new inner scenario because we are strengthening it daily by affirmations or visualization or in some other way, it now tries to change the outer reality to match the inner one. We thus start having new experiences, meeting new people, spotting new opportunities which we earlier used to miss and so on. Slowly, life starts changing for the better. Whatever be the explanation, it is a fact that a change in thinking changes life. 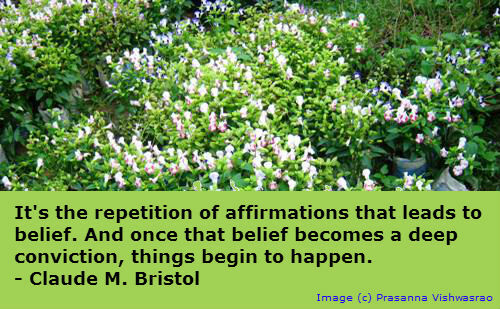 And a change in thinking can be easily brought about by using affirmations. 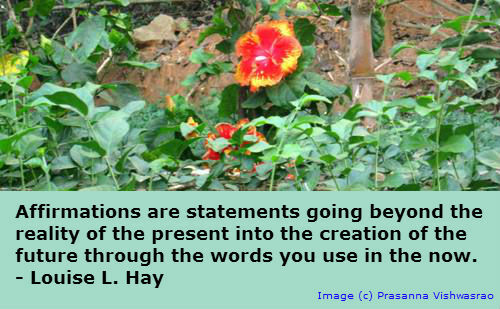 Thus, if we make positive statements and repeat them over and over, they are going to affect our life positively. Similarly, negative statements will affect our life negatively. We go through our life according to our beliefs. For example, we know it and hence it is our belief that if we touch anything hot, it will cause burns. Hence we don't touch hot things with our bare hands. However, the belief system of small children is not yet formed. Hence, they do not know the difference between hot and cold and are likely to touch hot things with their bare hands. (hence we have to take greater care of small children than grown up children). If they get their hand burned, or alternatively if they are told repeatedly that touching hot things is bad, then their belief system forms and they will avoid touching hot things. This is an example of affirmations at work. All our beliefs are stored in the subconscious mind. So, if you find that you are unable to make lots of money, or, you make money but are unable to hold on to it, it may be due to such beliefs held in the subconscious mind as "I do not deserve to be prosperous" or "Money is bad", etc. In order to change our beliefs, we have to operate at the level of the subconscious mind. The subconscious mind is like your computer. It takes an input, processes it and gives an output. It does not think by itself. It does not distinguish between good and bad. If we put garbage in a computer we get garbage as output. (Hence the phrase GIGO which means Garbage In, Garbage Out). That is why your mother told you to keep good company and avoid bad company. In good company you hear good and positive thoughts, see good actions being performed, good deeds being done. By constantly being in good company these good things get impressed on your subconscious mind and, in turn, your thoughts and actions also turn out to be good. That is why Napoleon Hill says, "If you want to be rich, be in the company of rich men". Also, it is a known fact that your income tends to be the average of the incomes of the ten people with whom you associate yourself the most. So, in order to change your beliefs and create a new reality, you have to bombard your subconscious mind with thoughts of your desire. However, these thoughts have to be worded carefully, otherwise the results may not be as expected. Use the present tense. Do not use the future tense. If you say, "I will be rich", your being rich will forever be in the future! The subconscious mind tries to literally bring about what it is asked to do. Hence say "I am rich" or "I choose to be rich" or "I am ready to be prosperous". According to some psychologists, the term "choose" is better as then, being rich becomes your choice. And anyway, isn't it true that your present life is the result of the choices you have made in the past? Be POSITIVE. Only positive statements work. It seems the subconscious mind is incapable of dealing in negatives. So, if you say "I am not fat", then when the statement reaches the subconscious mind, the term "not" is ignored and it becomes "I am fat"! Actually, what happens is that the law of 'focus and growth' applies. As per this law,whatever we focus on, grows. Hence, when we say 'I am not fat', the focus is on 'fat'. So the subconscious mind will concentrate on making you or on keeping you fat. It is better to say "I am fit and slim' or 'I weigh ____ pounds/kgs'. Affirmations can either be spoken or be written down. When speaking, repeat the statements emphatically, preferably throughout the day. The least you can do is repeat them at least twenty times in the morning just when you get up and twenty times in the evening just before you go to sleep. Better is to repeat them at least a hundred times daily. The more the better. Another great way is to write them down at least fifteen times daily. Writing is a faster way of impressing your subconscious mind. The importance of written affirmetions is amply demonstrated by the world famous 'Dilbert' cartoonist Scott Adams. Then there is also the famous "mirror technique" given below. Repetition. 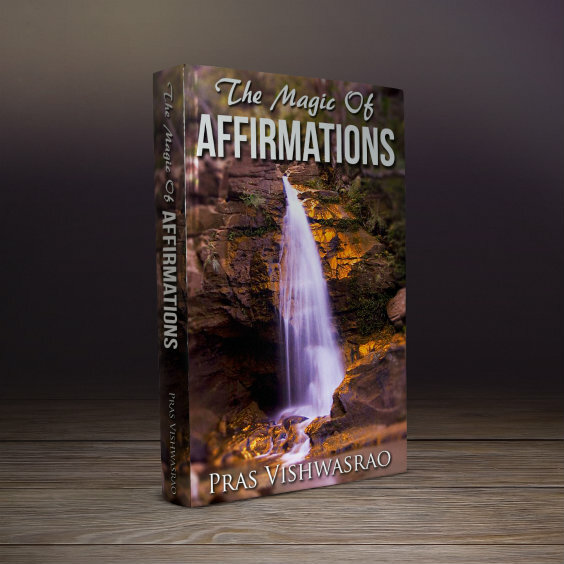 In order to bring about significant changes in your life, you have to be using affirmations several times a day till such time that they become a reality. If you do them for a few days only, the expected results may not come about. Be bull doggish about them, i.e. continue doing them till your goals are accomplished. There is a story of two neighboring villages A and B which always faced water shortage. Village A then learnt of a rain dance which they performed and duly received rains. Seeing this, village B also performed the rain dance but did not get any rains. They did this several times but still no rains. Ultimately, the chief of village B approached the chief of village A and asked for help. The chief of village A replied, "We do the rain dance till we get the rains." Ditto for affirmations. Do them till you get your desired results. Stand in front of a mirror, look into your eyes and repeat the affirmations with gusto. Put energy into them. Looking into your own eyes deeply helps connect with your subconscious mind. However, you have to do this on a very regular basis. 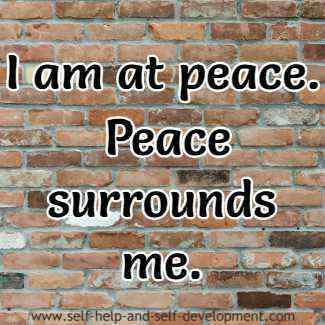 In fact, Louise L. Hay says in her above mentioned book that when you are in your house and whenever you pass in front of your mirror, stop and repeat the statements a few times. This is a very powerful technique. I can personally vouch for the efficacy of this technique. These are known as 'affirmation cards' or 'goal cards'. Take a 3” x 5” card that can snugly fit into your shirt pocket or wallet. Write your affirmation in bold letters. View your 'affirmation cards' as frequently as possible. Wherever you are, you can quickly take out your card, read it and keep it back. But show it to no one. Declaring your intentions to the world seems to dissipate the energy that you put behind it. Try to view the card at least 10-12 times a day, the more the better. The frequent bombardment of the subconscious mind with your goal will bring about the desired results. Here is a list of affirmations which have been going around for decades and have produced wonderful results for many people. I have prepared some sample affirimations on a variety of topics. Please remember that you may also prepare your own on similar lines. Also, it is a good idea to combine one or more of them. Whenever possible, say them in front of a mirror. Also remember that you are trying to reprogram a lifetime of thinking habits. This takes time. If you are repeating the statements about a hundred times a day in front of a mirror, allow a period of at least six months to elapse before expecting results. Combining creative visualization and affirmations can lead to speedy results. Successful people have used these positive statements regularly. Read here what they have to say about their experiences. 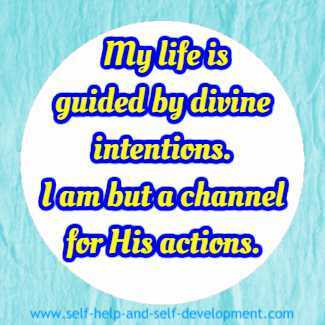 My life is guided by divine intentions. I am but a channel for His actions. I attract only positivity in my life. 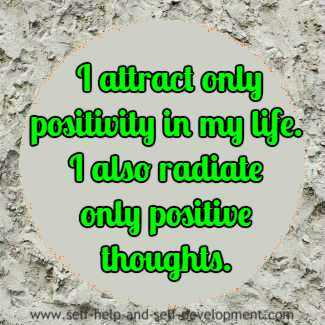 I also radiate only positive thoughts. Money flows into my life easily. I was, am and will always be prosperous. 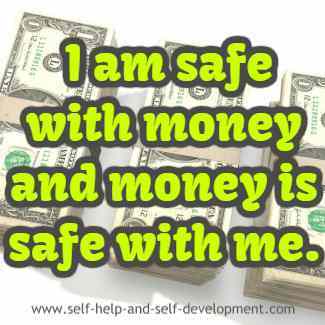 I am safe with money and money is safe with me. 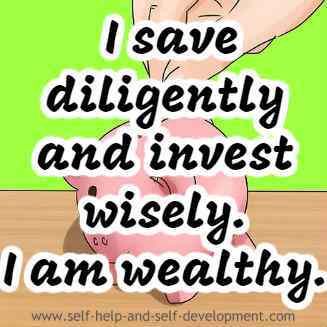 I save diligently and invest wisely. 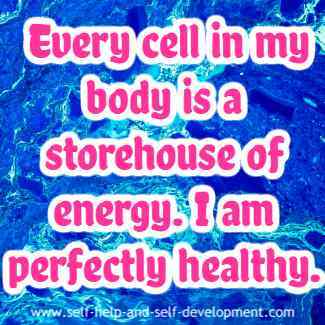 Every cell in my body is a storehouse of energy. I am perfectly healthy. I am immersed in love. I always give out love and in return, attract love. 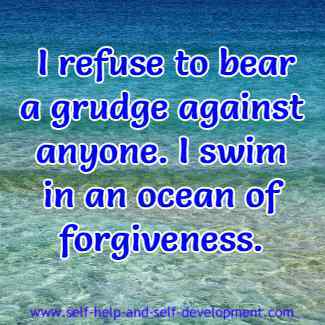 I refuse to bear a grudge against anyone. I swim in an ocean of forgiveness. 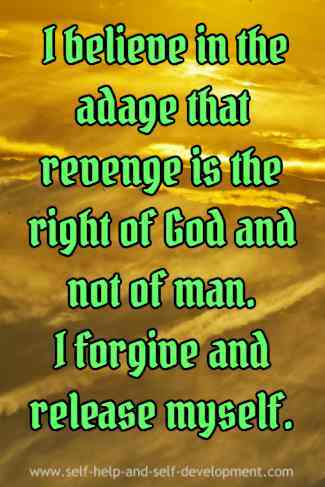 I believe in the adage that revenge is the right of God and not of man. I forgive and release myself. 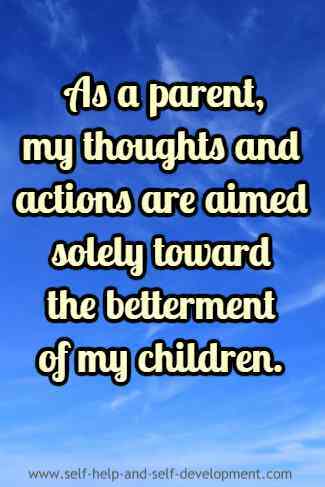 As a parent, my thoughts and actions are aimed solely toward the betterment of my children. 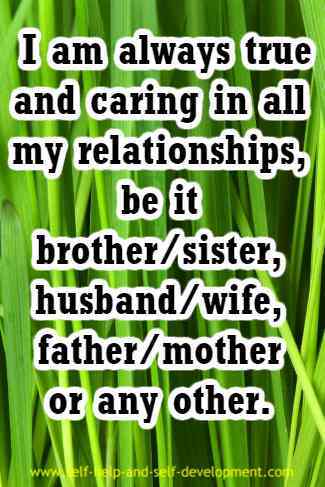 I am always true and caring in all my relationships, be it brother/sister, husband/wife, father/mother or any other. 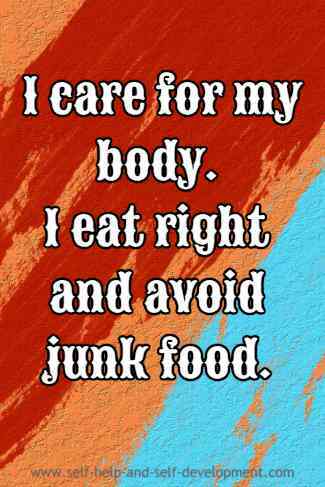 I care for my body. I eat right and avoid junk food. My first love is for myself. 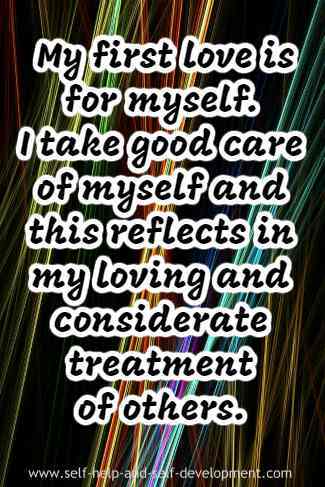 I take good care of myself and this reflects in my loving and considerate treatment of others. 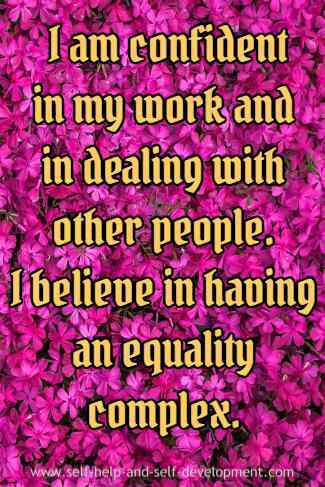 I am confident in my work and in dealing with other people. I believe in having an equality complex. I am a God-loving person. 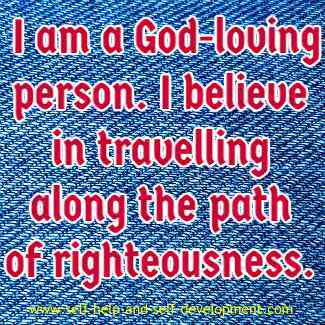 I believe in travelling along the path of righteousness. I am in control of my own life. 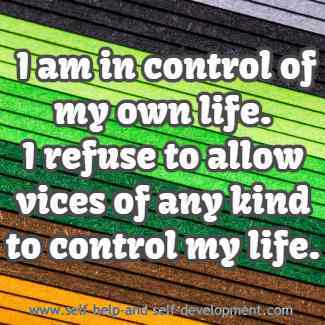 I refuse to allow vices of any kind to control my life. My life is full of happiness. I am wearing the happy man’s shirt. 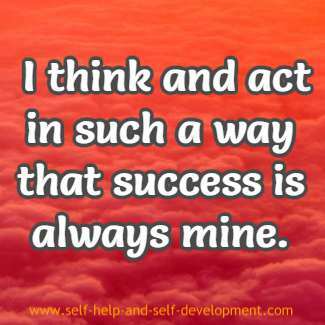 I think and act in such a way that success is always mine. 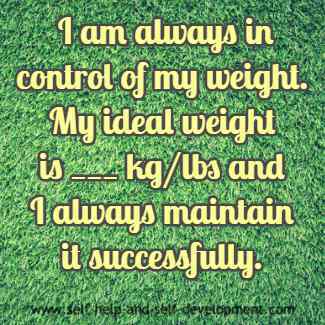 is ___ kg/lbs and I always maintain it successfully. 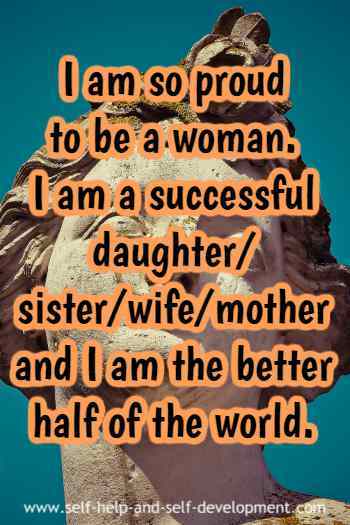 I am so proud to be a woman. I am the better half of the world. I am enjoying my life as a student. 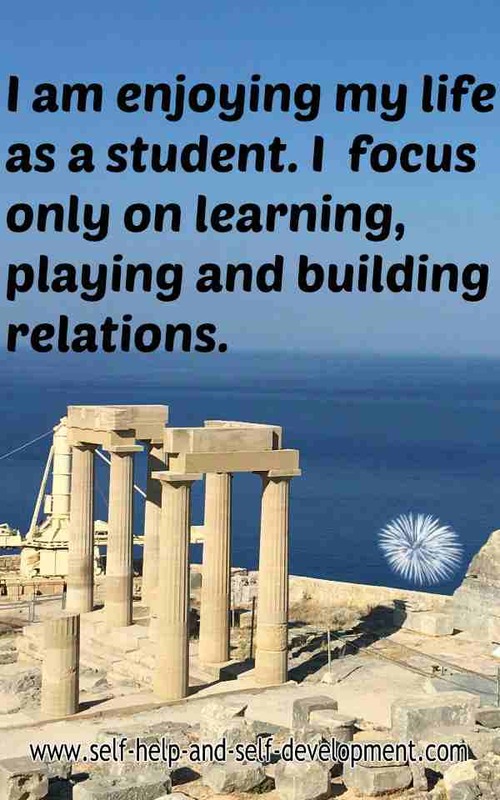 I focus only on learning, playing and building relations. I take good care of my body by exercising regularly. Life is good. 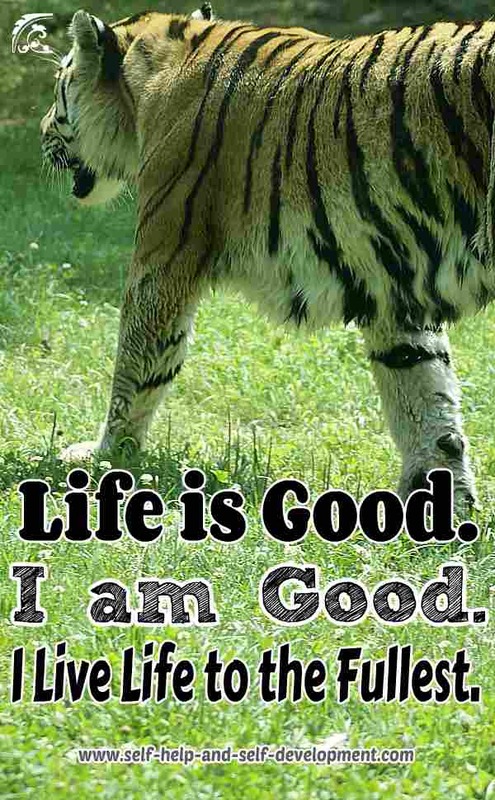 I am good. I live life to the fullest. 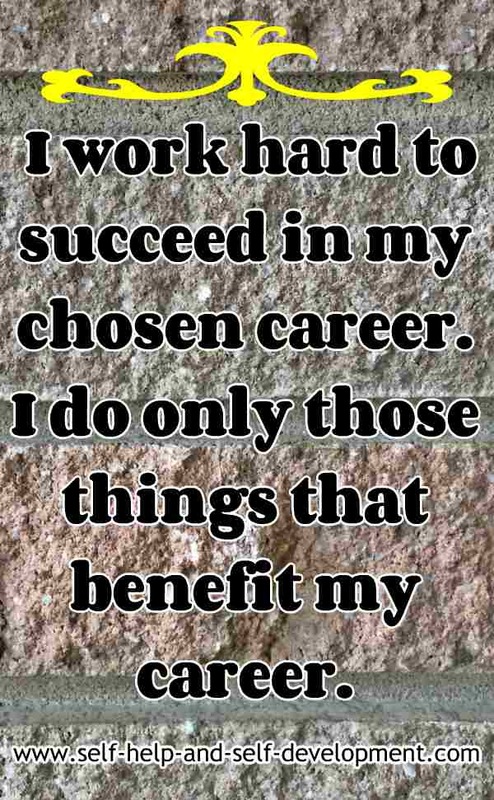 I work hard to succeed in my chosen career. I do only those things that benefit my career. As the saying goes, "the proof of the pudding is in the eating". Stories of success with affirmations are proof that they work. Click here to read a fascinating success story from a real person.